Am I injured or just really sore? Now that footy and netball season are underway there is likely to be a few sore bodies getting around. But how do you know whether you’re sore or actually injured? Following exercise our bodies can pull up with a significant level of soreness. This soreness is referred to as exercise-induced muscle soreness or DOMS (delayed onset muscle soreness). DOMS is thought to be caused from microtrauma to muscular cells and connective tissue – and is usually the result of performing high intensity exercise that our body is unaccustomed to. It usually develops over the first 1 to 2 days following exercise and shouldn’t last more than 7-10 days. Techniques such as massage, stretching, water immersion or jumping in our float tank can all be beneficial to assist recovery from DOMS. Acute injuries tend to result from a specific incident during exercise. Pain may be present immediately or soon after finishing in a specific, more localised body part. Sometimes, you won’t be able to continue to exercise at the time the incident occurs. Swelling can be present immediately or soon following, or not present at all. If you have sustained an acute injury it’s best to book an appointment with us at Enhance so we can get you rehabbing properly and get you back to it. Concussion is a traumatic brain injury that is defined as a complex process affecting the brain, caused by external mechanical forces. A concussion is caused by a force transmitted to the head or body, which causes movement of brain tissue within the skull. It is the high-speed movement of the brain tissue inside and against the skull, which causes concussion and therefore is not always caused by a direct impact to the head. Concussion can be a result of a direct impact to any part of the body, if the impact is large enough to transmit force to the head and disturb or increase movement of the brain within the skull. 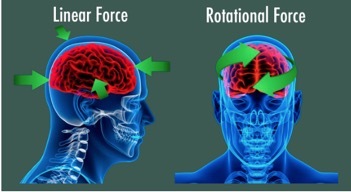 Whilst most people think head on collisions and front on impacts in sports are the most common scenario for a concussion injury- both linear and rotational forces affecting the head or body can cause concussion. The amount of force required to cause a concussion varies and therefore you cannot judge the extent of the concussion by the incident itself. Angular acceleration caused by head/neck rotation: a large tackle where your trunk is twisted one way and your head/neck in the opposite direction or a direct impact to the side of the head or body. A person with a SUSPECTED concussion must be removed from play immediately. The player should be assessed by a health professional BEFORE returning to play. 5 R’s (Recognise the injury, remove from play, refer, rest & return to play when cleared by Medical Professional). 5-10% suffer prolonged symptoms (post concussion syndrome). Our Physiotherapists at Enhance Physiotherapy can assist you with a Graduated Return to Sport Strategy to assist you with returning to sport post concussion. And remember, “If in doubt, sit them out”.